When you think of places you can grow exotic fruits, England probably isn't the first place you think of, not with the famous rain and unforgiving winters! However, all the fruits we mention on this list can be grown in the UK. Although you may need to adapt your garden routine to give some of these plants some special attention, it's only a small amount of extra effort and you'll be rewarded with a bounty of unusual and satisfying fruits. How Can I Grow Exotic Fruits In My Garden? There is a wide range of fruits you can choose from. However, it's important to point out that although certain fruits can be planted straight into the ground, others will need to be grown in a container for the best results. Bear in mind that if you choose to grow your plants in a container, they may not be hardy enough to deal with winter's sharp frosts. Therefore, you should most likely transfer them into a garden where possible. If you don’t have the space to grow fruit indoors during winter, but want shelter for the fruits of your labour why not invest in a greenhouse? The alternative method of growing is to plant straight into the ground. This method works particularly well with more robust fruits. However as with all things in gardening, a little extra time, effort and patience when planting pays off for years to come; so to give your plants the best chance, take your time and never cut corners. If this is the route you want to go down, here is our top planting method. Ensure to dig holes that are around twice the depth and the width of the container which the plant came in, loosen the soil below this, and then refill with 25% compost soil up to where you want to plant. If the soil is dry be sure to water it, you can then retain moisture by placing manure or chipped bark above the soil. This also works wonders for repelling insects and garden pests. For exotic plants, watering them is a little different to some of the more native specimens. Exotic plants generally prefer a heavy soaking once a week, as opposed to a light spray daily. Watering correctly promotes healthy and full root growth, which in turn will assist your plant in harbouring the perfect, delicious fruits! What Exotic Plants Can Grow In The UK? It’s important to keep in mind that while these plants can be grown in the UK, many of them will require special attention or pruning to flourish. Others however are able to be left to their own devices. 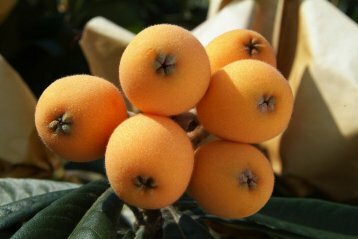 Chinese Loquats –the Chinese loquat is an exotic and sweet fruit with a beautiful shrubbery. In both autumn and winter the Chinese loquat blooms fragrant white flowers with deep orange/yellow fruits. In the spring you will be rewarded for your hard work with a sweet, plum like fruit. Although these plants are easily durable enough to survive harsh winters, the Chinese loquats will only bear fruit in warmer conditions. With this in mind, a warm room or a greenhouse is the optimal place to grow these luscious fruits. Pineapple Guava ­– this plant prefers a warm, sunny environment. Your hard work tending these fruits will be rewarded first with aromatic edible flowers. The main event however, is the skinned egg-size fruits that taste like plums, apples, peaches, strawberries and pineapples all rolled into one. Pineapple guavas are able to survive lows of -12°C in winter, although fruits will only ripen during the summers. 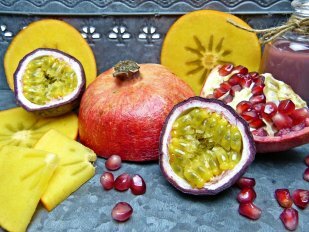 Passion Fruit – this is a fruit that most people in the UK are familiar with, but may not have tried to grow themselves. Passion fruit plants are climbers that prefer to be grown facing north, with lots of sun and lots of TLC. When they have grown to their full potential, you will need to ensure that they are properly supported, with weekly watering throughout spring and summer while ensuring they have plenty of room to grow and expand. Pomegranates – Pomegranates not only taste great but their plants have a very rich and colourful appearance, making for a stunning focal point for your garden. The plant blooms all over with rich, red flowers meaning that they produce lots of fruit in the correct conditions. In the wrong conditions however, they tend to be less forthcoming with their fruit. If its the fruit you're after, ensure that they get as much sun as possible and are protected from the harsher UK weather! Growing exotic plants in the UK can be done with a lot less effort than many might expect. Some exotic fruit plants can actually handle the colder conditions better than some native fruits and vegetables. You always have the option to grow them within a sheltered container, or better yet a Greenhouse, Garden Shed or Outdoor Living Room. 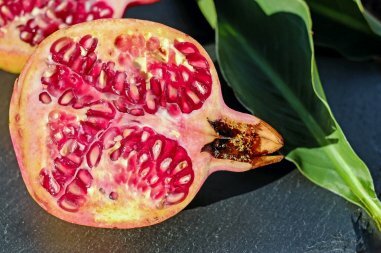 If you want to grow some exotic plants, it's easy to find a guide for growing each exotic fruit. With all the tips you've now been given in the article, we guarantee that all it takes is time and effort to turn your garden into a cornucopia of luscious produce. Why not sit back and marvel at your new exotic garden from the comfort of one of our bespoke Garden Buildings? A Summerhouse or Garden Room is that extra touch that could make your outdoor space even more special. Most garden buildings do not require planning permission but further information can be found in our related article: Planning Permission for Garden Buildings. All of our buildings are fully customisable to your exact requirements. You'll even benefit from free delivery and installation by our expert team as part of our end to end service. To discuss your options further, there are several ways to get in touch. You can Request a Callback, Contact Us or call 01760 444229. Alternatively, if you’re in the area why not visit us at one of our seven UK National Show Centres to experience the luxury service we provide first-hand. We have over 25 different size and style garden buildings on display for you to view at your leisure.